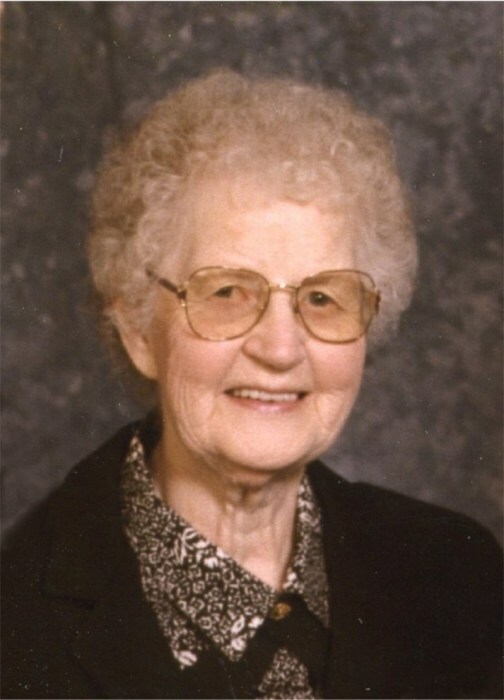 Emaline L. Hagen, age 98 of Sauk Rapids, formerly of Brooten, died Wednesday, March 20, 2019 at the St. Cloud Hospital. Funeral services will be held at 11:00 A.M. on Saturday, March 23, 2019 at Messiah Lutheran Church in Sartell. Visitation will be one hour prior to the service at the church. Interment will be in Our Savior's Lutheran Cemetery in Brooten. Arrangements are with the Hoplin-Hitchcock Funeral Home in Brooten. Emaline LuVern (Suckstorff) Hagen was born August 2, 1920 at home in Gilchrist Township, Pope County, Minnesota. She was the daughter of Theodore and Anna (Reirson) Suckstorff. She graduated from the 8th grade in District #13 country school in Pope County. After country school, Emaline worked as a housekeeper/babysitter starting at the age of 12 for her brother, Julius. On December 30, 1941, she was united in marriage to Oliver Hagen at Our Savior’s Lutheran parsonage in Brooten. She and Oliver farmed and raised their family in Norway Lake Township. Emaline served as clerk for District #73 for 4 years. She was a Sunday school superintendent at Sunburg Free Lutheran Church for 8 years along with being active in the ladies aid, serving as president and treasurer. She also served as president of Our Savior’s Lutheran Church and president of the Our Savior’s ladies aid. She worked at Fingerhut in Benson for 4 ½ years and Jennie O’ Turkey Products for 7 ½ years. In 1980, Emaline moved to Brooten where she volunteered at the food shelf for 12 years; senior dining dinners, judged Halloween Costumes at the grade school and participated in the “Monday Morning Bible Study Group” for 15 years. Emaline enjoyed spending time with her family and friends, reading, embroidering, crafts, knitting and crocheting. She also enjoyed walking for exercise and fishing. She moved to the Oak Apartments in Good Shepherd Community in Sauk Rapids, Minnesota in January of 2011. She made her home there for the last 9 years; making many friends, who she enjoyed playing cards and bingo with. She died March 20, 2019 at the St. Cloud Hospital. Emaline is survived by her son, Orlando Hagen of Minneapolis; daughter, Elaine (Richard) Hanson of St. Joseph; daughter-in-law, JoAnn Hagen of Sauk Rapids; grandchildren: Daryl (Cheri) Hanson, Christopher (Jessica) Hanson, Eric Hanson, Stacy (Ben) Steel and Sarah (Louis) Cook; great grandchildren: Elaina, Lillian, Alaric, Oliver, and Adria Hanson, Evan, Brandon and Alyssa Cook, and Jordy Steel; numerous nieces, nephews, other relatives and friends. She is preceded in death by her parents; husband, Oliver in 2003; son, Marvin Hagen in 2010; brothers: Julius (May), Alfred (Eleanor), Arthur (Eileen), Harlan (Angie), and Lester (Marion) Suckstorff; sisters: Marie (Albert) Hunt and Louise (Peder) Johnson and a sister in infancy.